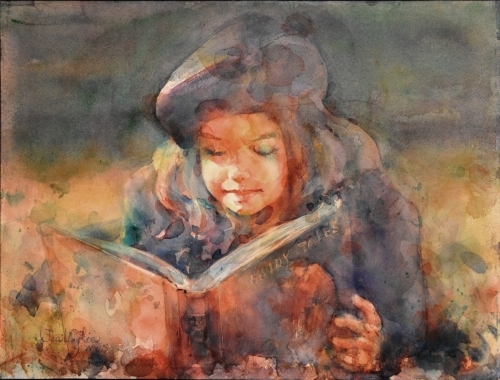 Watercolor painting is one of the oldest and arguably greatest techniques of painting, which has been becoming more and more popular. The upsurge in popularity is most assuredly owed, in no small part, to its versatility and simplicity, which give one an opportunity to experiment with the medium. Not only with materials on which the paint is applied, but also with the different styles and different themes. To start painting anything in watercolor requires a little more planning and patience. Whether you are painting from a photograph or from daily life, it helps to establish your composition at the beginning. Knowing how much of your subject you will be painting will make things much easier down the road. Step No.1: Draw out the subject lightly in a hard pencil, such as a 4H. Pay enough attention to the dark and light shapes in the head and face rather than the finer details. You are going to be working from general to specific and the details will come later, so use a big round or flat brush, not a small rigger or liner for these washes. Step No.2: Block in the darkest values first using dark washes. Avoid using black, but instead, combine Burnt Umber and dark blue for anything exceptionally dark. It helps to squint your eyes while looking at your subject to help isolate the dark values. Don’t worry that these washes are not dark as they could be; you will have a chance to darken them more later. Step No.3: Using lighter washes, block in the lighter values of the face, leaving the lightest areas untouched. Avoid oversaturated colors by using plenty of water in your washes, and tone down your warm washes with a tiny bit of a cool pigment, such as a dark blue, to keep them from becoming too intense. Step No.4: After laying down your lighter washes, it’s easier to see where your first washes can be darker. Using a higher ratio of pigment to water, go back and re-establish the darkest values; in this case the hair and glasses. Step No.5: For hair, pay attention to where the highlights are located. You can often showcase these just by leaving a previous lighter wash visible while blocking in darker values. You don’t need to paint every strand; the value difference will show the viewer that the hair is shiny. Work into the details of the face with a smaller round brush. 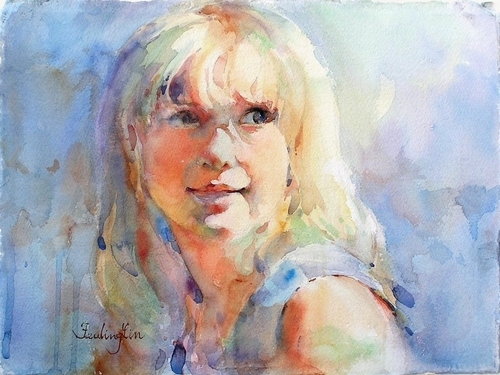 Hope the above tutorial can be helpful for you to create beautiful watercolor portrait paintings. Watercolor painting (watercolour), is a painting method in which the paints are made of pigments suspended in a water-soluble vehicle. The term "watercolor" refers to both the medium and the resulting artwork. The traditional and most common support for watercolor paintings is paper; other supports include papyrus, bark papers, plastics, vellum or leather, fabric, wood, and canvas. Watercolors are usually transparent, and appear luminous because the pigments are laid down in a relatively pure form with few fillers obscuring the pigment colors. Watercolor can also be made opaque by adding Chinese white. In East Asia, watercolor painting with inks is referred to as brush painting or scroll painting. In Chinese, Korean, and Japanese painting it has been the dominant medium, often in monochrome black or browns. India, Ethiopia and other countries also have long traditions. Fingerpainting with watercolor paints originated in China. 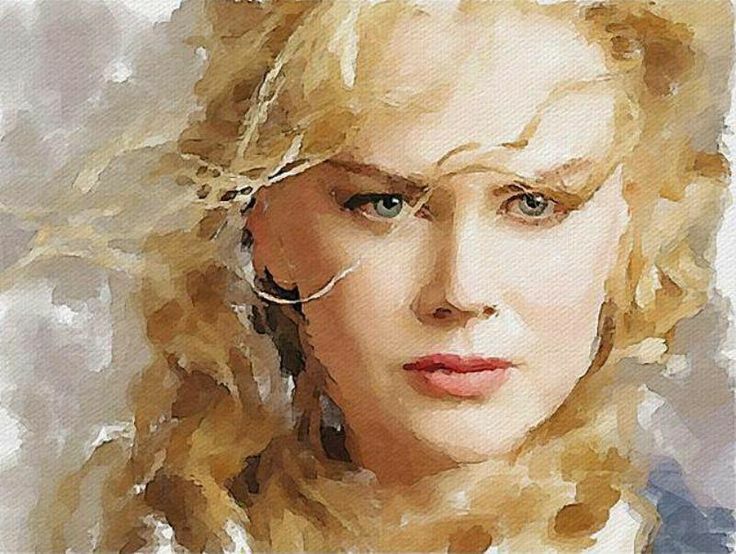 Tags: Portrait Painting Techniques in Watercolor Art--Professiona Tutorial, Watercolor Portrait Painting Techniques.